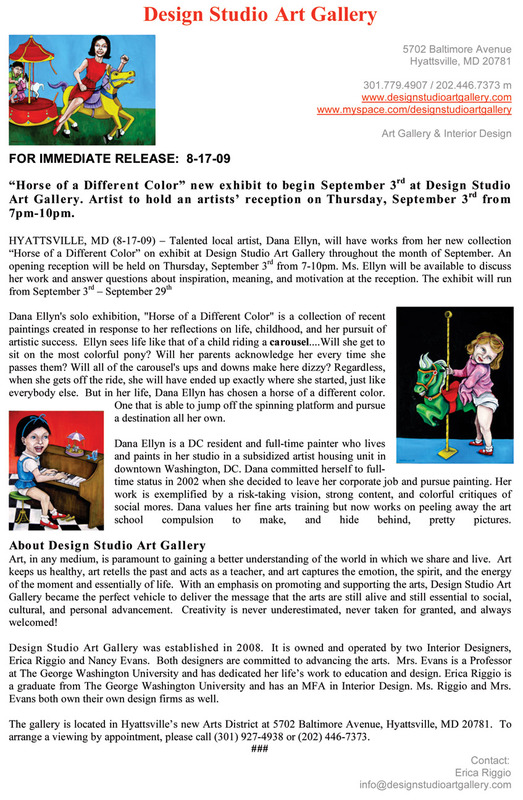 Dana Ellyn's solo exhibition, "Horse of a Different Color" is a collection of recent paintings created in response to her reflections on life, childhood, and her pursuit of artistic success. Ellyn sees life like that of a child riding a carousel....Will she get to sit on the most most colorful pony? Will her parents acknowledge her every time she passes them? Will all of the carousel's ups and downs make here dizzy? Regardless, when she gets off the ride, she will have ended up exactly where she started, just like everybody else. But in her life, Dana Ellyn has chosen a horse of a different color. One that is able to jump off the spinning platform and pursue a destination all her own.